Thanks for the story, Beldar. 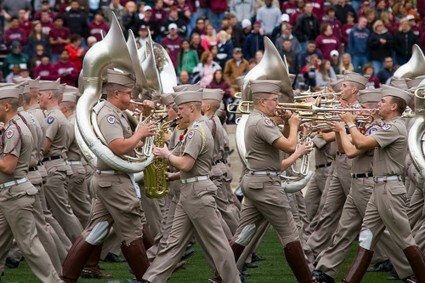 As a former (high school) sousaphonist, I feel a certain tinge for that poor bandsman...even if he's an Aggie. Sorta. Maybe. Apropos of nothing in particular than timing (since we set this up last night), I'll be able to watch The Showband of the Southwest in October when I fly into Texas and join my brother and nephew at the OU game in the Cotton Bowl. Undoubtedly, a good time will be had by all. Well, at least the UT fans, and we're the only ones that count, anyway. Thanks for the kind words, Boyd, and I hope you have grounds to celebrate next October. I recall that the next day after the 1974 game (which I think was played on a Friday for national TV purposes), the Austin American-Statesman had a front-page photo of the sousaphone bell all by its lonesome, out on the field — it was an emblematic symbol of how everything that could go wrong for the Aggies that day, did. I'm sure the Statesman still has that photo somewhere in its archives, but alas, that's from a pre-internet age and consequently much harder to obtain. That was 2 years in a row of bad luck for the Aggie band. I was at the 1973 Rice-A&M game where we poked fun at the Aggies. Dear Mr. Dyer: I repeat, you need to give up this attorney business and set up shop writing. Terrific story.